Centrally located in Barcelona’s Raval District, just 300 metres from Universitat Metro Station, Dailyflats Raval offers modern accommodation with free WiFi and a balcony. Plaza Catalunya is 8 minutes’ walk away. These apartments feature exposed brick walls and some come with vaulted ceilings or exposed wooden beams. They come with a kitchenette equipped with a dishwasher, oven and coffee machine. Their living areas include a flat-screen TV with cable channels, DVD player and sofa. You will find bars, restaurants and supermarkets in the surrounding streets. 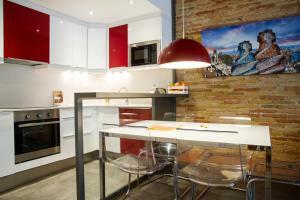 Sant Antoni is a 5-minute walk away and Barceloneta Beach is 2.5 km from the property. Sagrada Familia is 10 minutes’ metro ride from Dailyflats Raval and Barcelona Airport is 15 km away. Please note that check-in takes place at the reception, which is located in Villarroel, 28, and opens from 9:00 to 22:00. Late check-in after 22:00 incurs a charge of € 25. A damages deposit of € 200 is payable on arrival. This will be refunded upon departure once the condition of the apartment has been checked. For stays of 7 nights or longer, free cleaning is included. Set over two floors, this ground-floor apartment features free WiFi. The kitchenette is equipped with a dishwasher, oven and coffee machine. The living area includes a flat-screen TV with cable channels, DVD player and sofa. This apartment comes with 1 bedroom, 1 bathroom and features a balcony and free WiFi. The kitchenette is equipped with a dishwasher, oven and coffee machine. The living area includes a flat-screen TV with cable channels, DVD player and sofa. Rate: € 77.00 ... € 702.47; select dates below to get current rates. This apartment comes with 2 bedrooms, 1 bathroom and features a balcony and free WiFi. The kitchenette is equipped with a dishwasher, oven and coffee machine. The living area includes a flat-screen TV with cable channels, DVD player and sofa. Rate: € 89.08 ... € 632.61; select dates below to get current rates.